A Bar Harbor home is built from the ground up — literally. No fans of teardowns, Sue Turner and Karl Karnaky wanted to save their rambling, crooked 1940s camp overlooking Mount Desert Island’s Eastern Bay, but every one of the four experts they consulted advised them to let it go. It would cost more to build a new foundation, winterize, and remove black mold than it would to start over. So the couple did the next greenest thing: they salvaged what they could from the camp and incorporated it into a new passive-solar house built from the very earth that was excavated to make room for it. 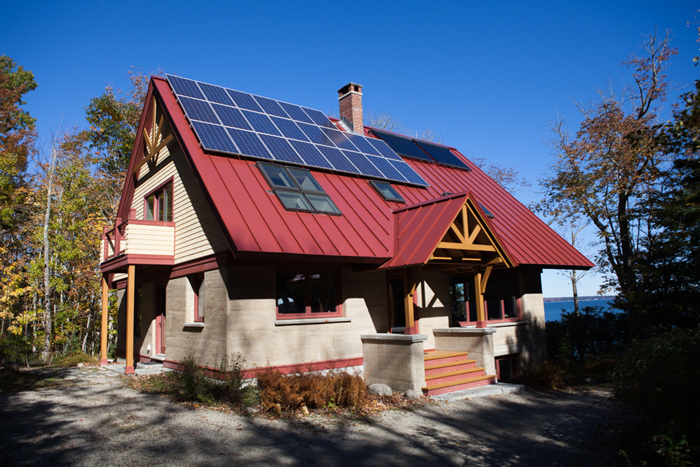 It is, they believe, the only rammed-earth house in Maine and possibly New England. “The rain will wash it away!” Karl Karnaky thought when his wife proposed building a house from soil. 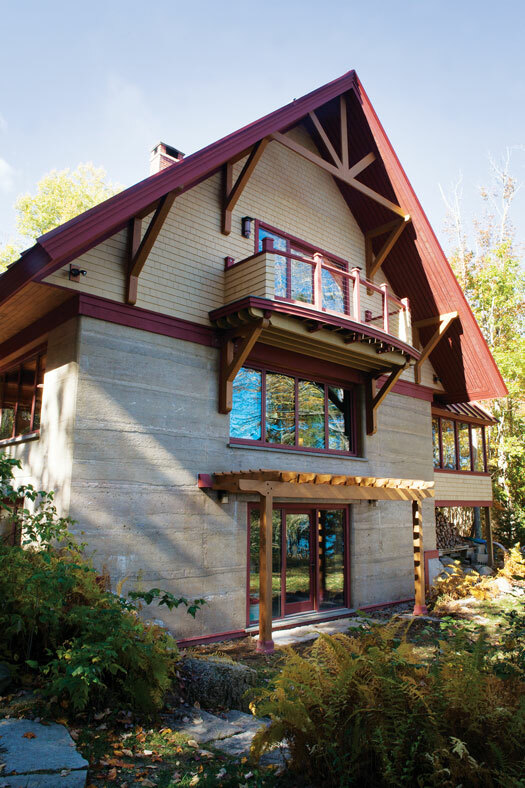 Their rammed-earth house has since proven to be both sturdy and ultra-efficient. 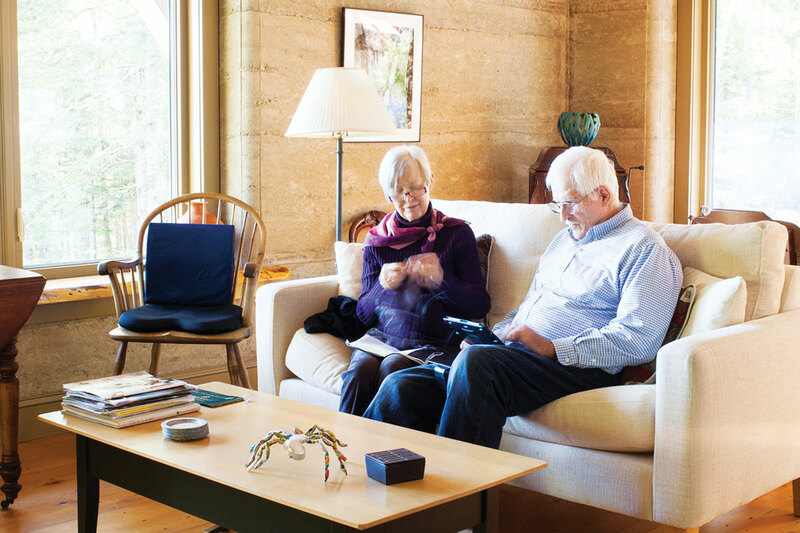 Retired professors who split their time between MDI and South Carolina, Turner and Karnaky used this ancient construction method to achieve state-of-the-art energy efficiency — they spend roughly $400 a year to heat and power their home, where they live half the year. Rammed-earth buildings can be found in Stone Age archaeological sites, and they are common enough today in the hot, arid Southwest that some states have building codes for them. If you’ve ever built a castle with wet sand and pails, you have the basic idea: earth is mixed with a little water, sand, stone, and Portland cement, then poured into forms and compressed, layer by layer, until the building height is achieved. The walls tell their story: their surface is imprinted with the rough texture of the forms that molded them. “The builders told us they could sand blast the walls flat,” Sue Turner says. 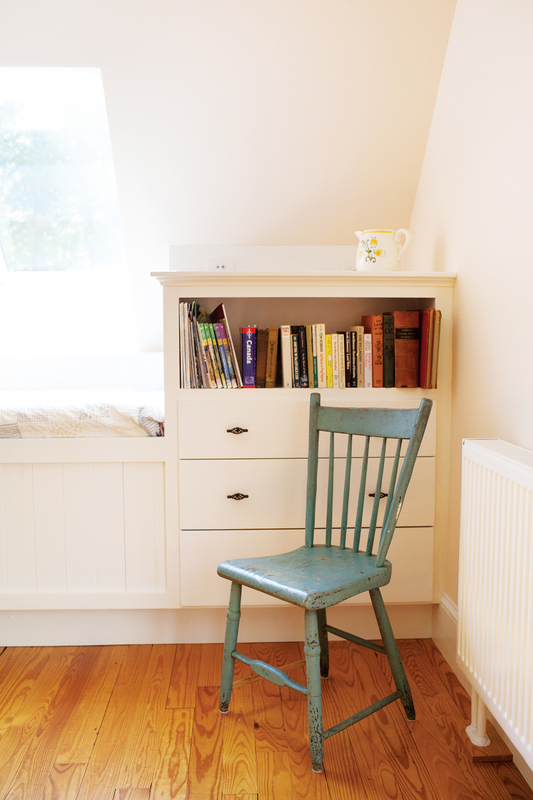 “We said, ‘Don’t you dare!’ ” Bernard carpenter John Law built most of the cabinets and doors with salvaged wood. Bill Shaw, who led the construction team, fashioned the railings from spruce branches. The chandelier is made from a vintage wagon wheel. 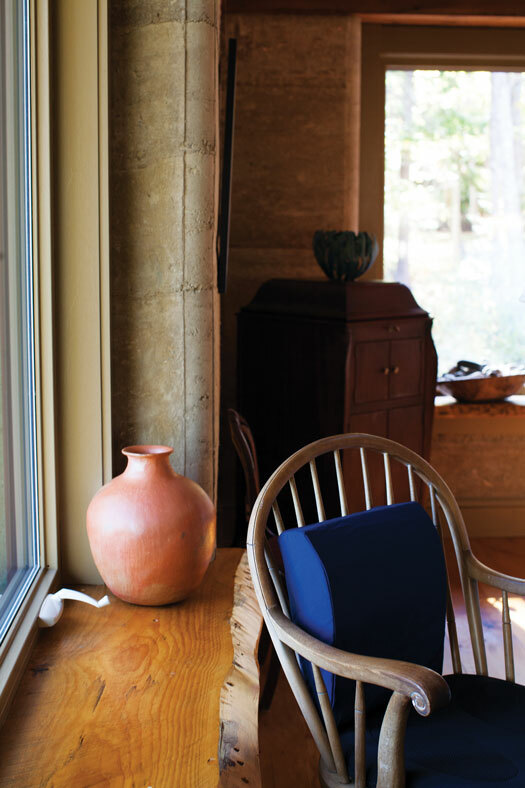 Rammed-earth walls absorb heat during the day and release it at night when temps drop. 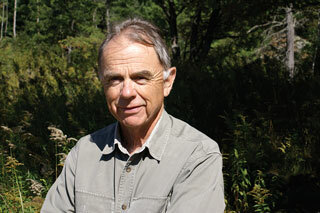 “In colder climates, you need to add a layer of insulation,” Turner says. “In some places, they put it on the inside. In others, they put it on the outside. We wanted to see the walls on both sides, so our insulation is in the middle, held in place by rebar.” The house is also equipped with electric radiant floor heat and triple-glazed windows. 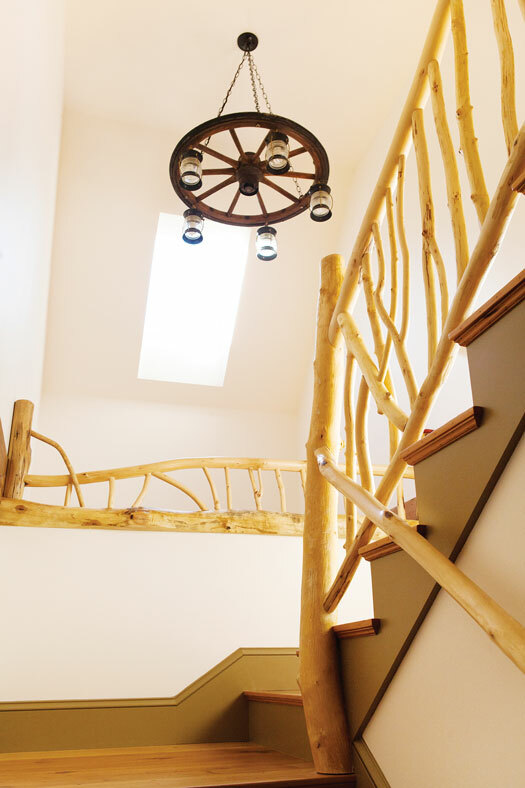 Their biggest challenge was finding contractors willing to try an unfamiliar construction method. Bar Harbor residential designer Barbara Sassaman designed the 2,000-square-foot structure, giving painstaking attention to the placement of wiring and plumbing: threaded into the 2-foot-thick earthen walls via PVC pipe, they can’t be easily moved to accommodate changes of mind. Before getting started, the MDI-based construction team — Bill Shaw, Rufus Nicoll, Mike Gilmartin, and Steve Gormley — built a practice wall to ensure the right soil-concrete mix. Typically, the mixture contains about 10 percent Portland cement, but Turner and Karnaky’s soil contains so much clay that they were able to reduce it to 7 percent. A soft gray with a textured surface imprinted by the wood forms used to mold them, the walls directed Turner and Karnaky’s furnishing choices. Their aesthetic is uncluttered and contemporary, but antiques and salvaged materials — particularly the doors and cabinets made from the siding of a demolished home — lend warmth and character, not to mention satisfying confirmation that they’ve trod lightly on the earth. Very nice house – absolutely one of a kind. Enjoyed Karl’s jokes in the Post Office today!